Wharton, Texas, sits about 60 miles southwest of Houston among miles of pasture and farm fields. The city’s murals proudly describe the area as “Brahman” and “Cotton Country.” Just outside the limits of downtown rests the derelict lot that once housed Wharton’s Shearith Israel Synagogue. The members who once gathered there traveled from as far as 50 miles to worship, and, at its peak, the congregation consisted of almost 80 families and 400 individual congregants. Over the course of 103 years, Jews in Wharton led a thriving existence, be it as members of the city’s merchant class, civic and religious organizations, or the congregation itself. However, like many small towns, the history of Wharton’s Jewish community is one of flourishing expansion and rapid decline. Photo courtesy of the Texas Jewish Historical Society. In 1876, Louis Peine arrived in Wharton via Indianola, Texas. Though there is evidence of a small group of Jewish settlers in the area around 1850, the Peines are the first documented Jewish family in the city of Wharton. Along with his son Ben, Louis Peine opened a jewelry store in town. The two would go on to become active members of the local Masonic lodge, with Ben reaching the status of Senior Deacon in 1887. In 1880, the Peines were joined by the family of Aaron Casper Finkelstein. Finkelstein would become the first lay leader of the Jewish congregation, initially conducting services in members’ homes. He was incredibly well-educated, allegedly speaking six or seven languages, and, as a young man, he had studied to enter the rabbinate, but was never ordained. A second assemblage of families arrived in Wharton in 1897. This group included the families of S.M. Ditch, Max Bishkin, Joseph Blumberg, Morris Meyers, Joe Schwartz, and A.M. Smith. Most of these early Wharton Jews were involved in retail trade. Often, opportunities in peddling and the prospect of one day opening a store drew many Jews to places like Wharton. As Mary Meyers Rosenfield, a former Wharton resident, recalled in a 2002 interview with the New York Times, “A hardware store in Galveston would give the men $50 worth of merchandise and send them out into the countryside to sell it. If they did well, they got $100 worth of merchandise, and that’s how we got started in business.” By the 1930s, Wharton’s town square was dominated by Jewish merchants. A handful of Wharton’s early residents had been sponsored in their passage to the United States as part of Jacob Schiff’s “Galveston Movement,” a plan to divert the influx of Eastern European Jewish immigrants who had become largely concentrated in New York to the port of Galveston. Between the years of 1907-1914, the movement brought approximately 10,000 Jews through the port at Galveston, many of whom, including the father of Mary Meyers Rosenfeld, settled and opened businesses in small towns like Wharton. By the 1890s, Wharton Jews were gathering together for religious services. Toby Gordon, who arrived in 1899, found this fledgling congregation barely able to gather the quorum necessary for a minyan. However, the same year Gordon arrived, S.I. Ditch purchased a Sefer Torah from New York City for the High Holiday services. Ditch, whom Gordon described as a “venerable middle-aged Jew” with “high ideals and a truly religious spirit” held social gatherings in his home during which he sold letters “to be filled into the Sefer Torah.” Through the sales, Ditch was able to help pay for the Torah’s cost. He moved to Houston only one year later, but Wharton’s Jewish community continued to expand. To many in Wharton, the purchase of the Sefer Torah was the official beginning of the city’s Jewish congregation. After Aaron Finkelstein, Ben Peine took leadership of the still-small assemblage. With Peine’s help, by 1908 the congregation began to meet in the Wharton Masonic Lodge. The lodge had previously been used by the Baptist congregation as a temporary worship space, and the only available seating consisted of beer barrels topped with flat wooden planks. Use of this location was relatively short-lived, as the lodge was destroyed by a storm in 1909. However, the congregation was steadily growing, and by 1910, its members had purchased a plot of land at the corner of South Rusk and Burleson Streets with the intention of building their own synagogue. By 1913, the congregation was officially chartered as Shearith Israel; however, it wasn’t until 1921 that the synagogue was constructed. The small brick building with its characteristic arch-shaped entrance cost only $7,500. The design was laid out by the architect C.E. Jopling, who had also constructed the Baptist Church, Wharton High School, and the Roberts Mercantile. Services for the laying of the cornerstone were conducted on November 24, 1921 by Orthodox rabbi M. Abramson of Galveston, and the cornerstone was laid by the local Masonic Lodge. The cornerstone was inscribed with the names of the new synagogue’s founding leaders to memorialize the event. Ben Davis, a Russian immigrant and grocery store owner, was the congregation president. Joe Schwartz, originally of Austria and the owner of a clothing store on the town square, served as the vice president, Herman Davis, a Russian dry goods salesman was the first secretary, and A. Morris served as treasurer. Ben Davis would go on to serve as the president of Shearith Israel for 25 years. By 1920, Rabbi Jacob Keilin, who had come to the United States from Russia in 1907, led the Orthodox congregation as rabbi, remaining with Shearith Israel for seven years. A series of short-term rabbis served the Wharton congregation until 1955, when Rabbi Israel Rosenberg took over the pulpit. Rosenberg remained with the synagogue for 23 years, the longest tenure of any rabbi at Shearith Israel. In 1937, the members chose to purchase three acres of land along North Alabama street and Barfield Lane for $750 for use as a cemetery. The first individual to be buried on the grounds was Aaron Davis of East Bernard, Texas, on May 13, 1937. 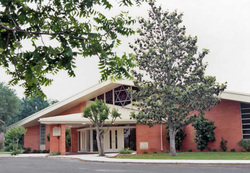 By 1992, 61 families and 123 individuals had been laid to rest at Shearith Israel. In 1940, the congregation purchased another stretch of property spanning for an entire block along Old Lane City Road. This became the location of the congregation’s social hall as well as the famous barbeque pit, which would become the centerpiece of Shearith Israel’s annual kosher barbeque. Congregants claim that hundreds of members, returning members, families, friends, and Jews from the surrounding region would attend the event, and it is fondly remembered as both an effective fundraiser and an important social gathering for small town Jews throughout the area. The congregation’s new religious school building was completed in 1952. This building was used until 1961, when it was sold so that a new brick complex could be constructed on the new property. 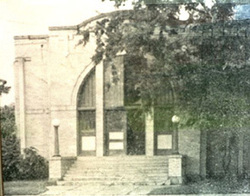 The new building contained classrooms, a meeting room, and the Maynard Smith Memorial Library. 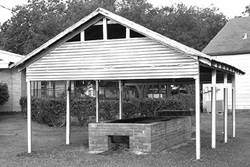 In 1956, the old building on South Rusk Street was sold and a new synagogue was built on the property containing the social hall and barbeque pit. The building was constructed in a Star-of-David design. The architect was Leonard Gabbert who had designed two synagogues in Houston before he was commissioned to create Wharton’s unique design. The building’s seating capacity was 376 people, which adequately accommodated the 290 men, women, and children who comprised Wharton’s Jewish community in the 1950s. The dedication ceremony, held on August 24-25, 1956, was attended by the mayors of Wharton, Edna, El Campo, and Palacios. Also in attendance were a handful of Protestant ministers from surrounding towns who came to bestow their best wishes upon the congregation in honor of their new synagogue. By the time of the new synagogue’s dedication, Shearith Israel had become a Conservative congregation, moving away from strict Orthodox practice. Multimedia: Shearith Israel's annual chicken barbeque drew Jewish and non-Jewish customers from Wharton and surrounding communities. In ISJL oral history interviews from July 2011, Larry Wadler and Adine Holland shared their memories of the successful fundraiser and community event. Throughout much its history, Wharton’s Jewish community was involved in several other Jewish organizations. Local Jews founded a B’nai B’rith chapter in Wharton in 1919, which remained active through the 1980s. In 1948, the first meeting of Shearith Israel’s Ladies Auxiliary was held in the home of Mrs. Aaron Block of Bay City; Mrs. Block would go on to be the group’s first president, followed by Mrs. Lew Todes. This organization became the Shearith Israel Sisterhood in 1956, when it became affiliated with the National Women’s League for Conservative Judaism. Mrs. Mervin Franklin of Wharton, who got her start as the president of the southwest branch of the League, would go on to become its National Vice President from 1965 to 1967. In the early 1950s, a branch of the Young Stars of David Judeans was organized; however, by the late 1980s the group had disbanded. Perhaps Wharton’s most well-established and enduring organizations was its Hadassah chapter. Henrietta Szold, the founder of Hadassah, traveled to Texas in 1914 with hopes of establishing chapters across the state and creating programs in the community to help underprivileged Jewish youths. She initially traveled to Houston, the home of Texas’ oldest congregation, but was unsuccessful. Szold had heard of the Jewish community in Wharton, and chose to try her chances there. Wharton’s first Hadassah meeting was held in the home of Mrs. Toby Gordon in 1914. Mary Meyers-Rosenfield, who attended this first meeting as a child, recalled watching a “tall lady wearing a hat [Szold]’” speak to the women’s sewing circle, and other stories claim that Szold traveled to Wharton by horse and buggy. The attendants of the meeting took interest in Hadassah, and, though they did not have enough members for a full-fledged chapter, “circle” meetings began taking place regularly following Szold’s visit. Wharton’s Hadassah chapter was officially chartered five years later in 1919. Szold always remembered her visit with the lady’s sewing circle quite fondly. In fact, for many years, the women of Wharton’s Hadassah chapter kept a handwritten note sent to them by Szold on their 25th anniversary; allegedly it was tucked away in a safety deposit box along with coleslaw recipe for the Shearith Israel barbeque. Multimedia: In this clip from the ISJL Oral History Program archives, Adine Holland and Larry Wadler discuss Wharton's Hadassah Chapter. By the 1980s, Shearith Israel’s numbers began to decline. In the 1960s the congregation had peaked at 77 families, however, in the 1980s the flow of new Jewish immigrants ceased. The baby boomer children of successful merchants went to college and did not return to run the family stores. Rabbi Jerome Cohen continued to serve the community despite dwindling numbers. However, by 2000, the congregation was no longer able to hold regular services. In 2002, Shearith Israel closed its doors with a remaining congregation of 39 members. The Torahs were donated to various organizationsand the cemetery was put into the care of a separate organization. In 2010, Shearith Israel's empty synagogue was destroyed by a fire. The remaining Jews in the area travel to Houston or to the small congregation in Bay City to worship.